Bushels of Values Ad from 1953! 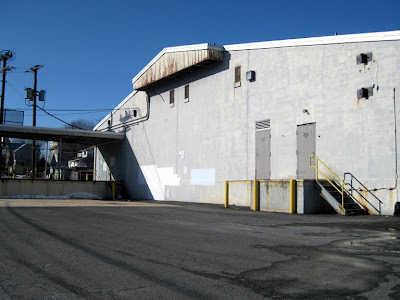 Fair Haven: To visit the Fair Haven Acme, please click here. Red Bank: Coming soon to Acme Style! Rolling out updates to former posts. 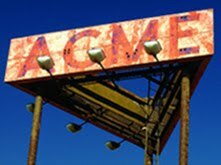 Some more interesting than others but I've listed them all here so no one misses out on the latest developments of their favorite Acme locations. Going forward I will do group updates like this one every couple of months to keep everyone in the loop. In other news... from here on out, the "Big Post of the Week" will debut on Friday mornings. Other posts may go up during the week such as News Breaks or Memorabilia posts, but the big one will arrive fresh on Friday mornings! The much delayed A&P Fresh... which rose from the rubble of the old Acme... opens today! Check out a picture and article here. For the original post, click here. Check out this really cool web page that shows the former Acmes of Tukerton. A former 50's store is just down the road from the present day Acme. 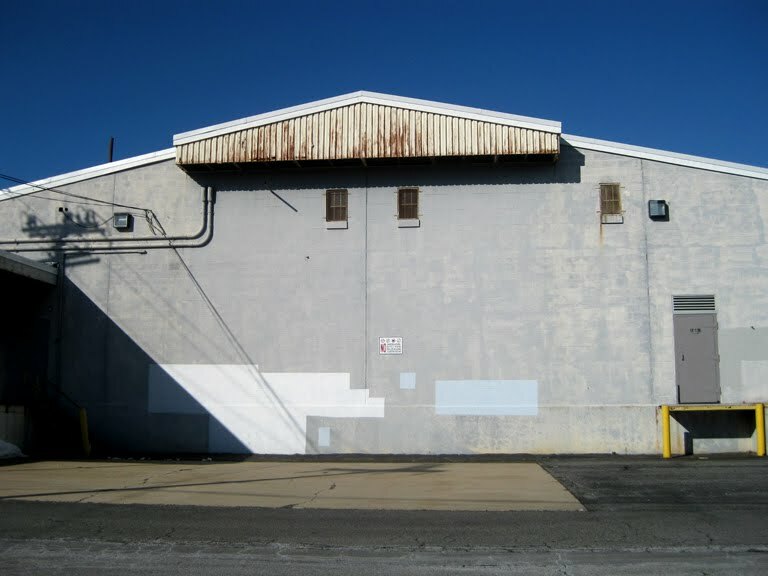 Some new pictures sent in by Michael Lisicky. A couple up-close shots showing some interesting detail. The pictures have been added to the bottom of the Beach Haven post. 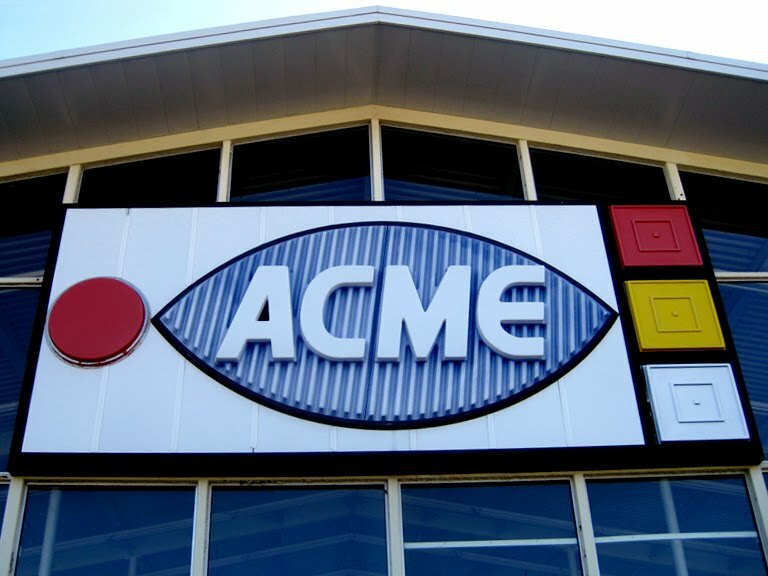 Acme has fianlly left the building. It is now boarded up and available for rent. Check it out here. For the original post, click here. 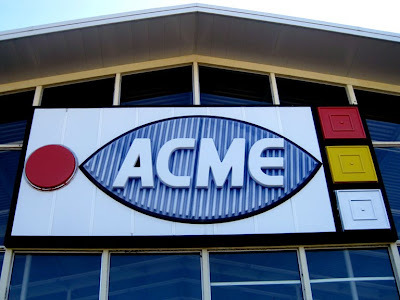 Acme has FINALLY left the building... Part 2. No pictures to show but a commenter has left word that Acme no longer holds the lease. 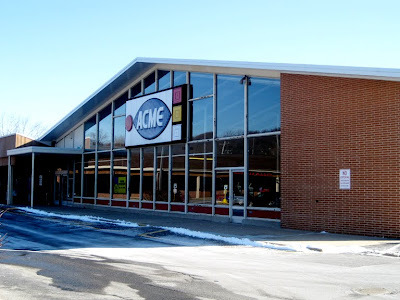 Walmart will be expanding... but not into the old Acme space. 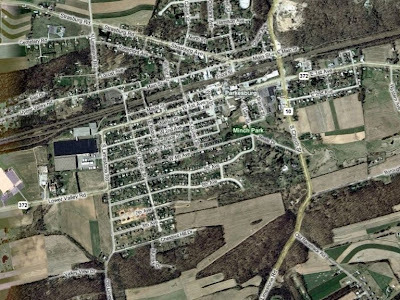 More details at the end of the Quakertown post. 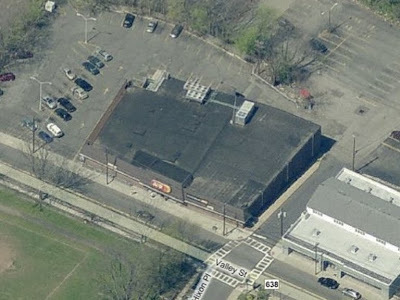 Lawrenceville Acme's "M" on fire! Check out this crazy picture of the M on fire. It doesn't look real! For new pictures of the "M" getting replaced, click here. 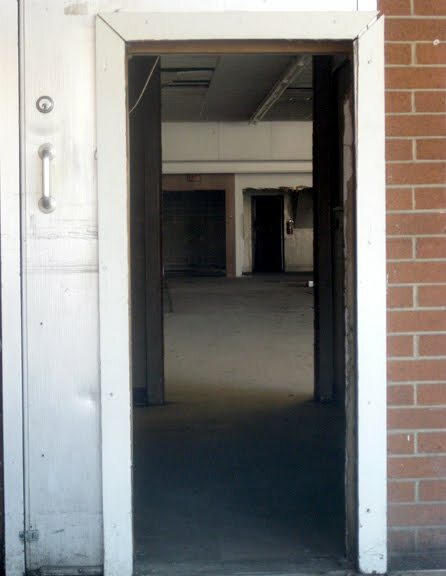 You wanna go in the old Grants store? 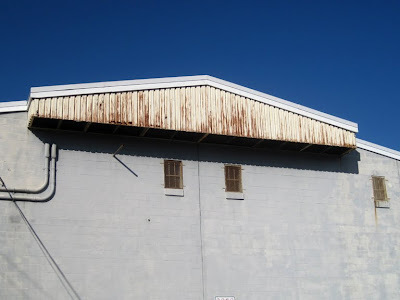 How about up on the roof? Click here to see it all! 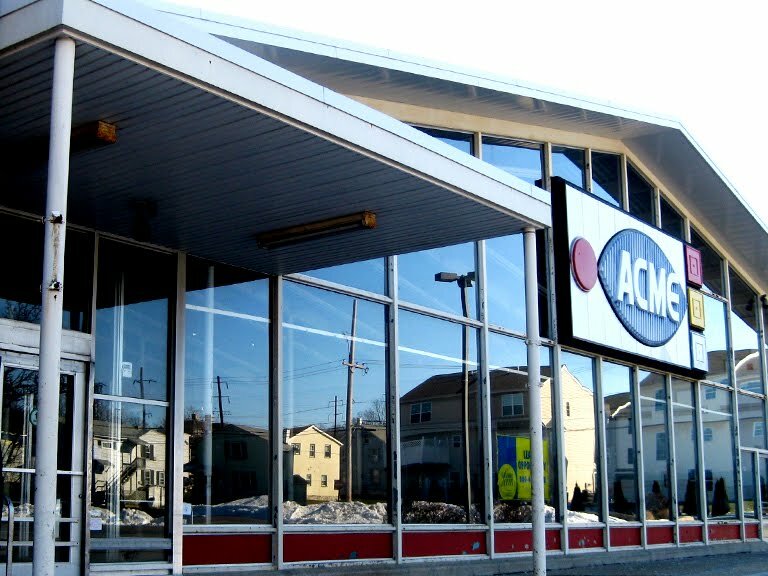 Former Jersey City Acme-Now a Fine Fare! 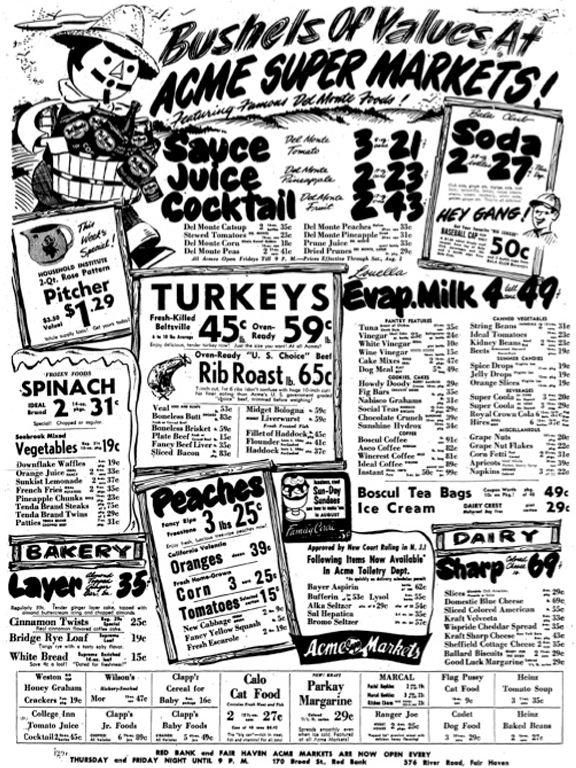 Fine Fare opened in the old Jersey City Acme way back in February just a couple of weeks after Acme closed. Pictures of the new store are now included at the bottom of the Jersey City posts. 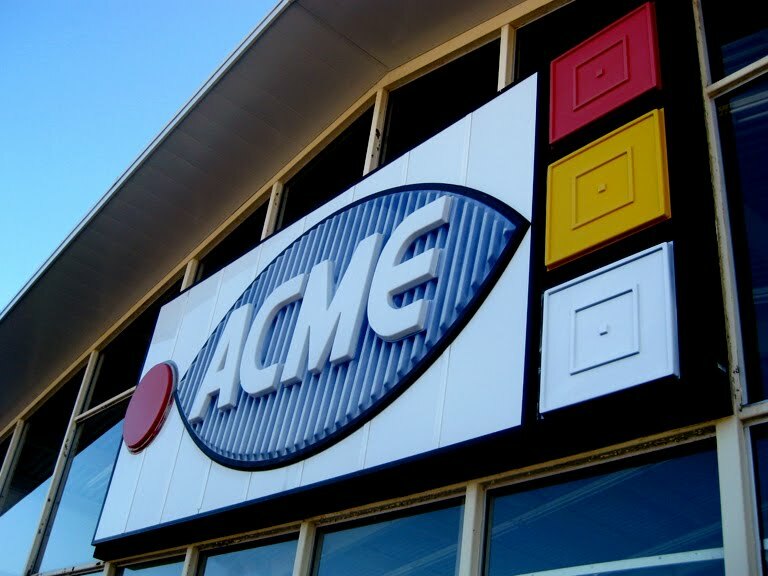 Acme Style's All-Time Favorite Acme! 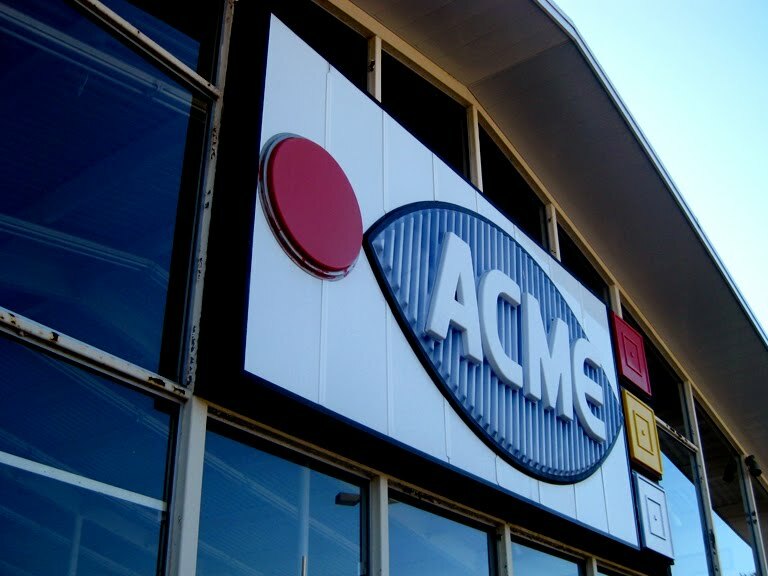 Not only a favorite but also the very reason Acme Style was born. 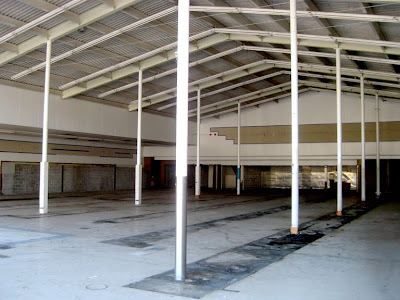 I discovered pictures of this store online back in 2004. 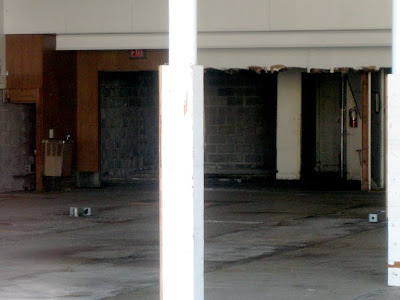 Couldn't believe someone had the foresight to photograph this store prior to closing. Even went so far to contact the company to request permission to photograph the interior. The pictures were used for a web page entitled "Last of a Kind". I was absolutely stunned when I first came across the site. 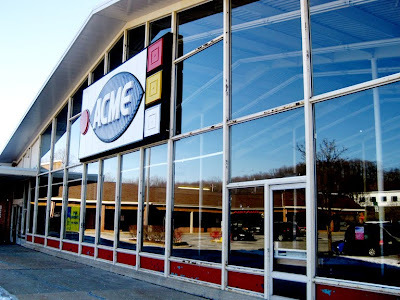 A whole page devoted to nothing but an old Acme. 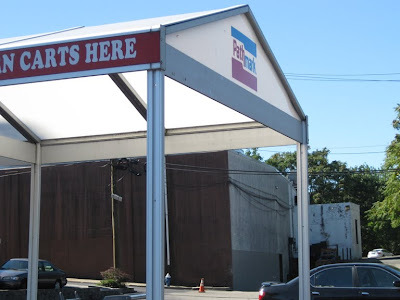 At the time, I never thought I would see an open pitched-roof store again let alone the fish-eye logo sign. And believe me, I had been trying. 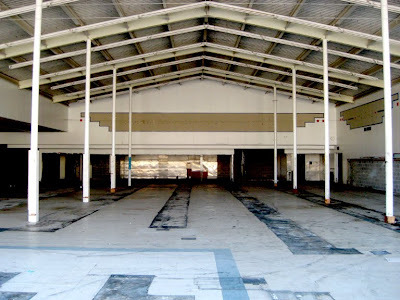 Searching all over the web for photos of old stores to add to my own personal collection. 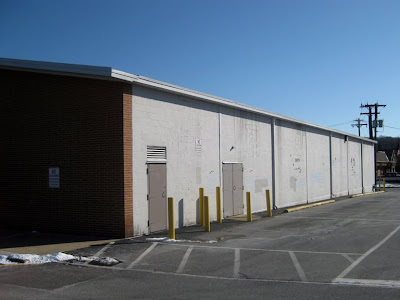 All the searching lead me to "retail history" sites like the Weis Project, Grocerteria and Lablescar which provided for hours of entertainment. But what about Acme? 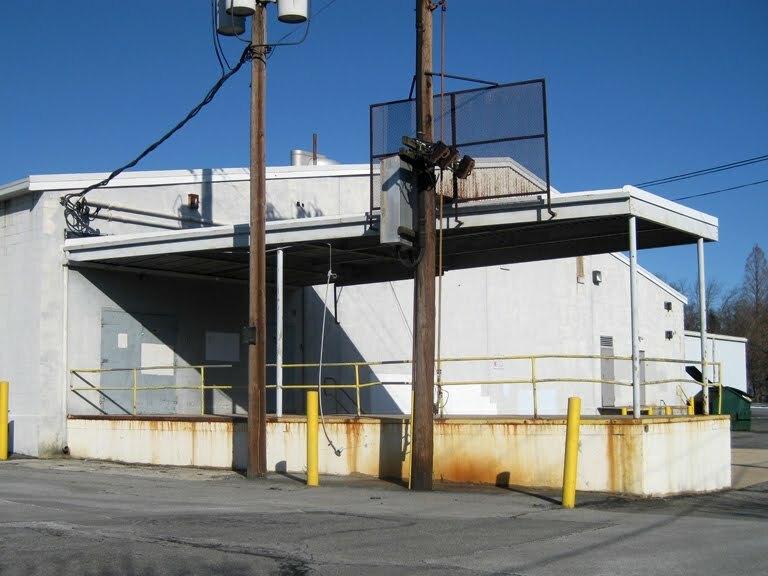 There was a serious lack of photos and history of the company online. Certainly not enough to satisfy my cravings So I spent the next few years wondering if I could start a site on Acme. 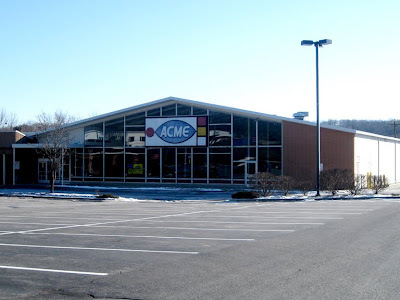 6 years later Acme Style was up and running. "Last of a Kind" is a web page by Alan Turner. Created back in 2003 just before the store closed. I have reached out to Alan a couple of times but have never received a response. You can view his page by clicking here. Thanks to Alan and to the other retail history sites for the inspiration to start Acme Style. Down below there are no shortage of photos for this store. I shot every last angle and detail despite the sub-zero temperatures of the day. 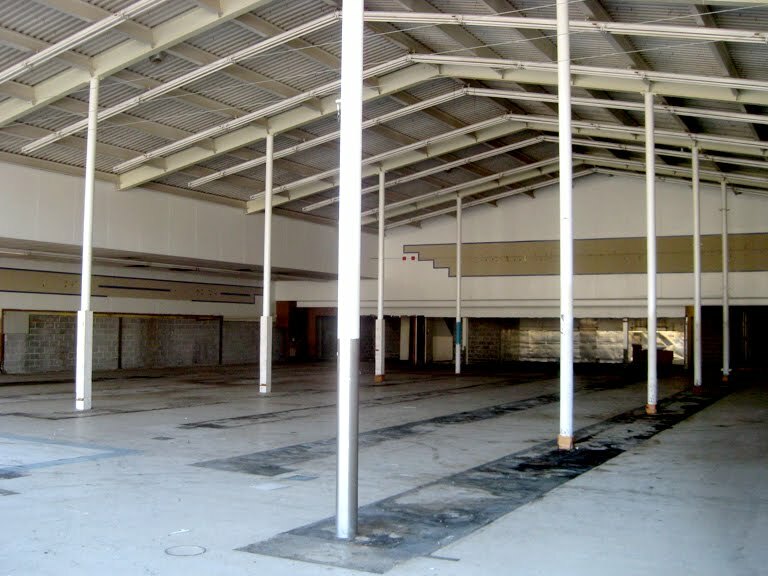 This store truly is "last of a kind" and by some miracle still stands in it's nearly original form after being in business for 34 years and now closed for 7 years. While I was there taking pictures someone started shouting to me from the other side of the parking lot "Turn it into a blowling alley!" Breaking news: The 3 colored squares on the right side were not in the same order on every store! Who knew? (The bottom square here has faded from blue to nearly white) When I first saw this sign years ago, I knew the colored squares were out of order. But what was the right order? 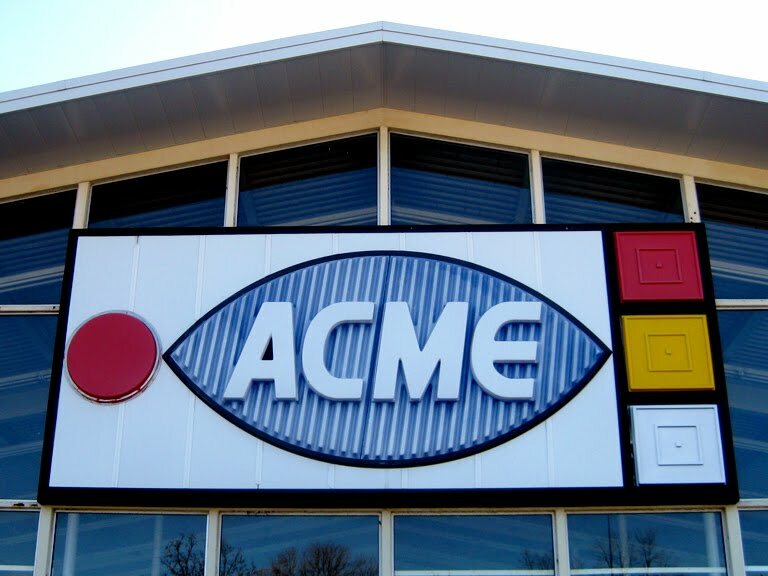 After reviewing all of the fish-eye signs appearing on Acme Style, it appears the correct order, or at least most commonly used, is... from top to bottom... blue, yellow, red. Haddon Heights: red, yellow, blue. Parkesburg was a small pitched-roof store with an awning just over the entrance and exit. 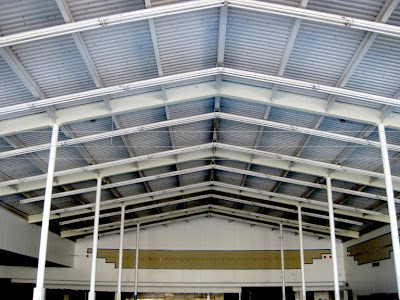 Larger pitched-roof stores had an awning across the entire front of the store. 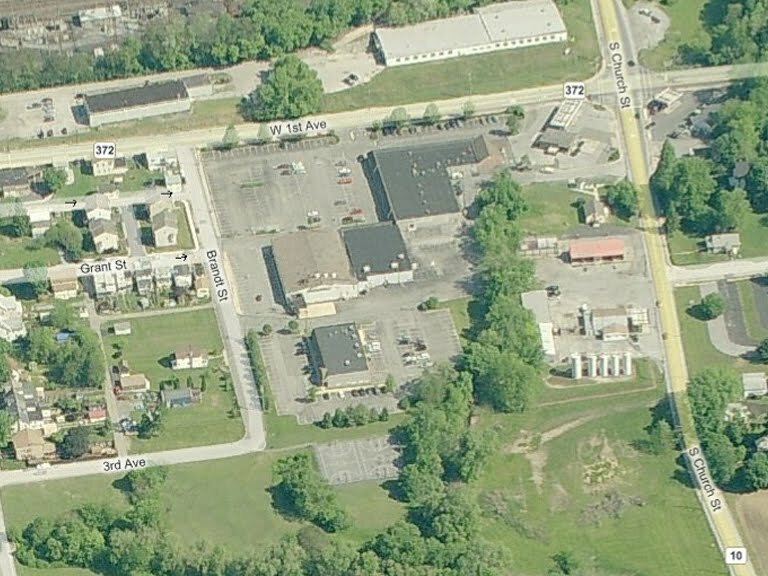 It's interesting how the pitched-roof model got smaller and became less deluxe over the years. That may have been done to reduce costs of construction and maintenance as Acme built these stores at a frantic pace throughout the 60's. 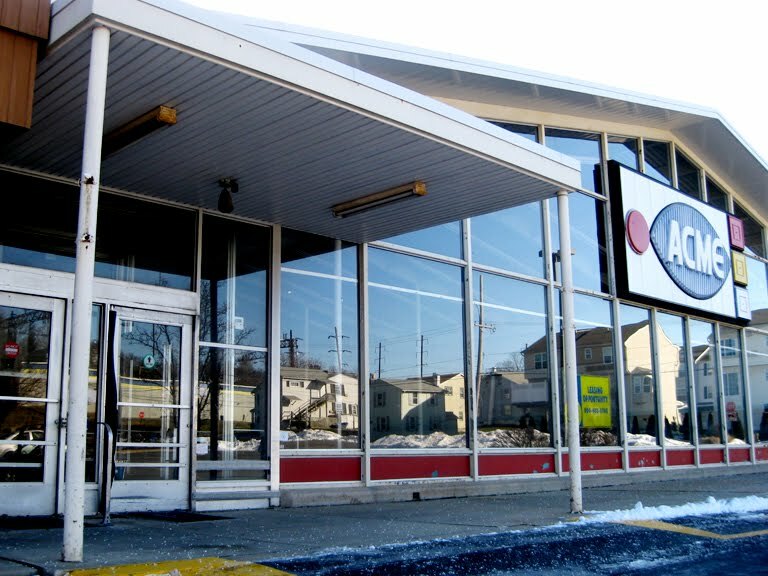 This location opened in 1969, just as the pitched-roof era was coming to an end. Similar picture to the wider one above but I love the interior roof view here. 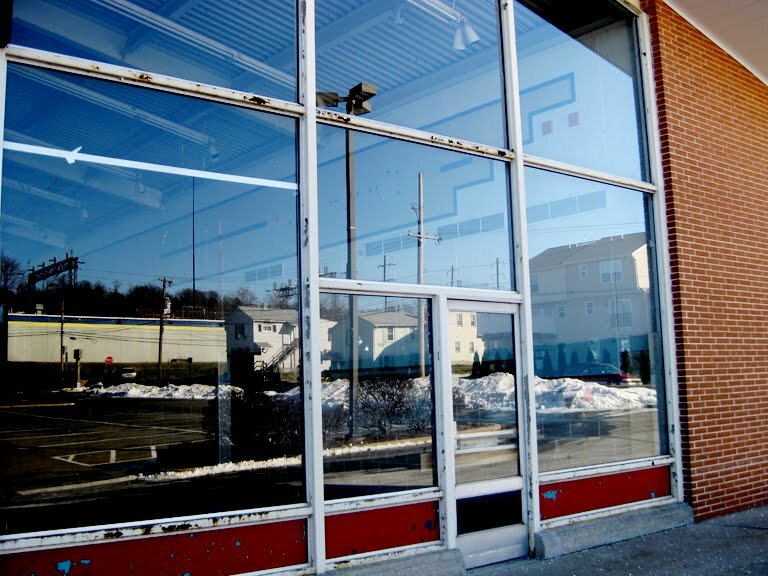 I imagine when these stores were first built the glass fronts created an illusion of no front at all. The emergency exits were included in later models of the pitched-roof stores. 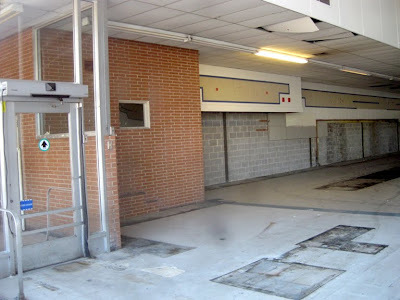 You can get a preview of the decor here... the dreaded Convenience Store look. I will say, however, that the look seems to have worked better here than at most other locations. "For Rent" sign in the window. 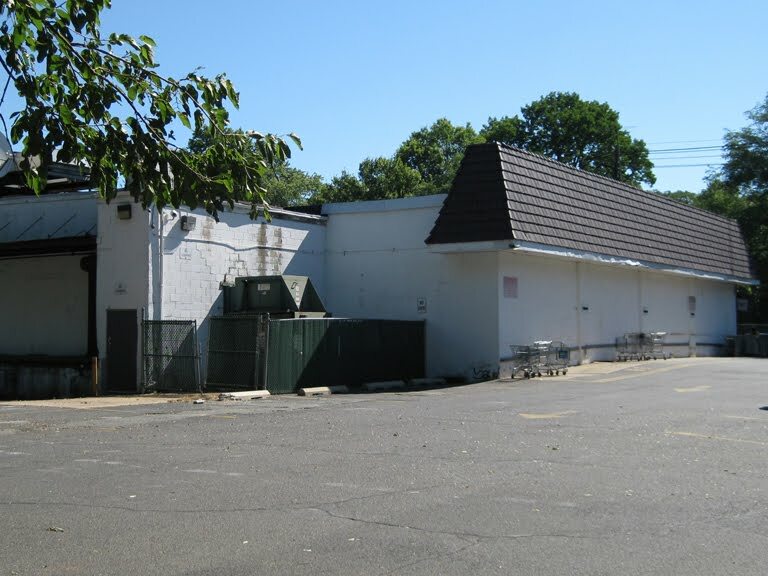 Offered by Levin Property Management which seems to be in charge of alot of former Acme's throughout New Jersey and Pennsylvania. Magic Carpets for opening the doors all the way to the end. 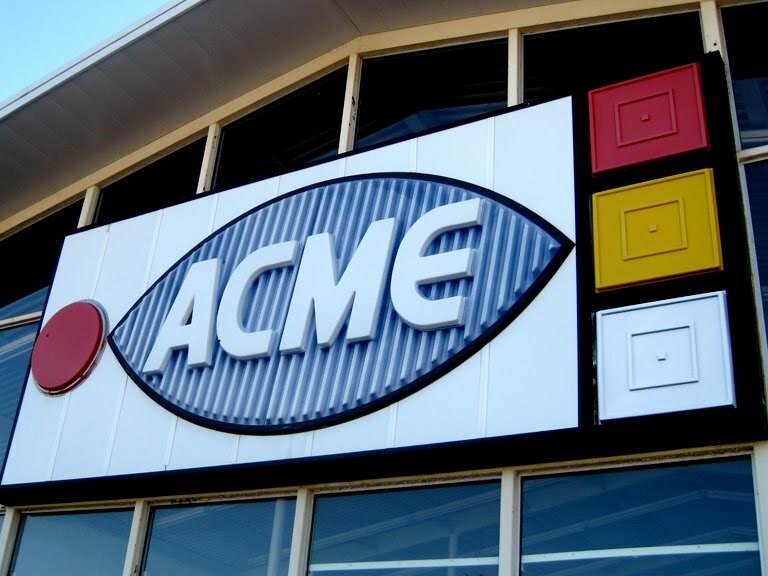 Notice how the door handles with the old cursive Acme logo are gone. 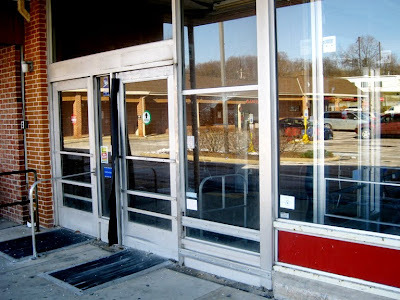 You can see the door handles at "Last of a Kind" by clicking here. 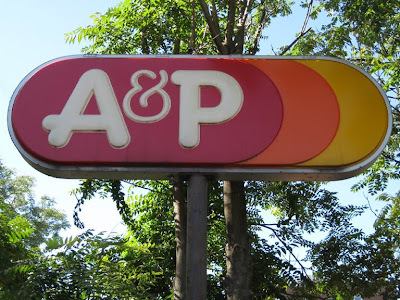 Unusual for the logo to have been cursive on a late 60's store. 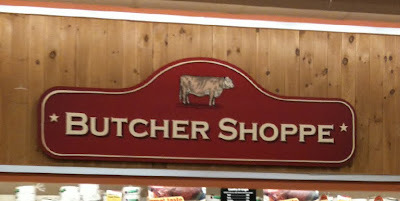 Most had the fish-eye logo on the handles which you can see at the Somers Point store by clicking here. 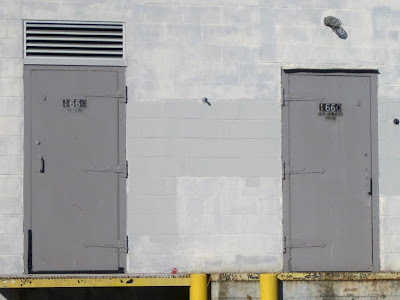 A second set of doors? Not common to pitched-roof stores. 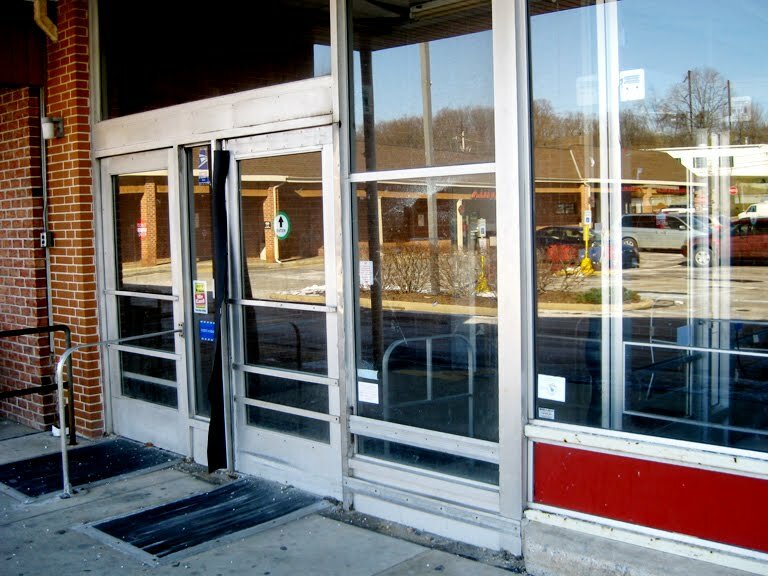 The Clayton store still has only one set of doors. 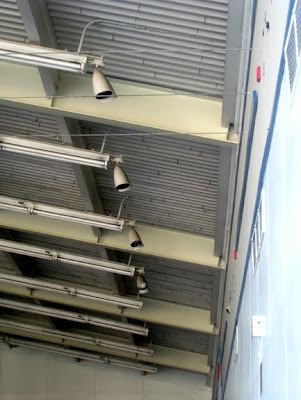 There, you are blasted by air vents when you walk into the vestibule to keep the outside air out. You can see the lack of interior doors at the Somers Point store by clicking here. The manager's office/customer service was behind the brick wall there. The window above was for keeping an eye on customers coming and going from the store. This is a first for me... the bread delivery door was inside the vestibule instead of on the outside of the store. 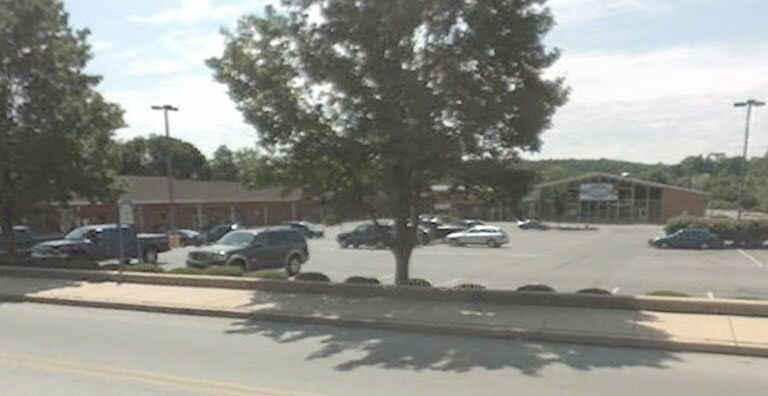 Located here since having it on the outside was not option due to a store being right next door. Not sure why the original door was resized. A view right into the bread room which was more likely used for computer equipment in the last decade or two. Lots to see here in this shot. First off... the front of the store was retiled at some point. I would guess that happened during the "Convenience Store" upgrade. 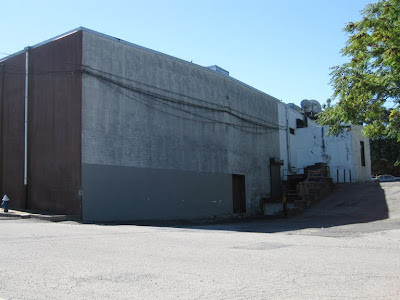 According to Alan's information, the store had a "major" remodel in 1988 but it does not appear to have had the 80's remodel. There is no checkerboard floor and the sign was not replaced with the red oval logo. I'm guessing that the '88 remodel entailed new cases throughout the store possibly brought in from a closed store or from an officially 80's remolded store. 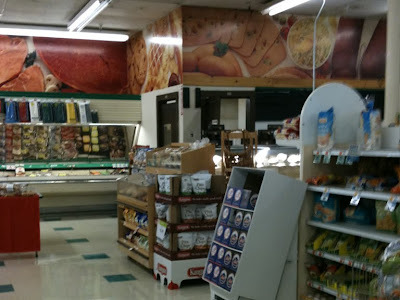 Perhaps the 80's decor was put up on the walls but the store certainly did not receive the full 80's remodel package. Secondly... check out the Customer Service area. It looks to have been removed from this location when the front was retiled. 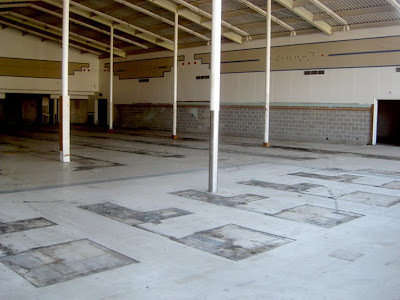 There are no scars on the floor from where a counter or express checkout stand would have been. 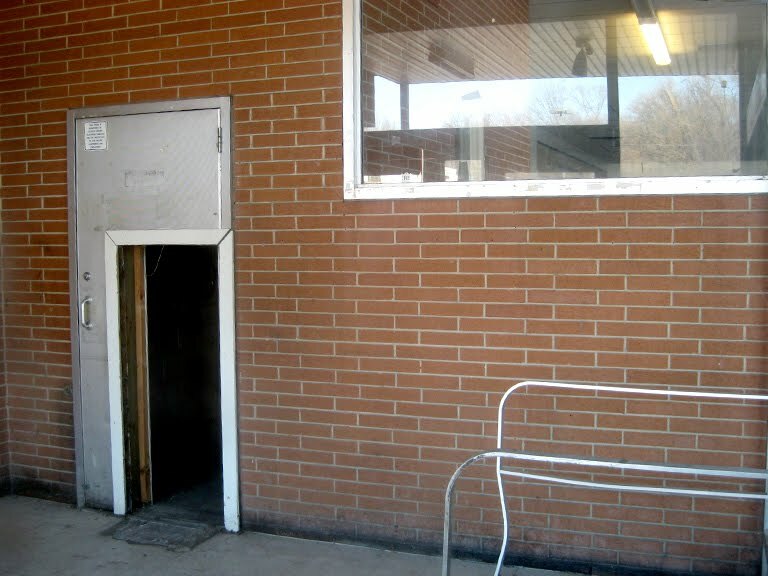 It looks as though this alcove just had shelving along the walls. Customer Service may have been moved down to the last register. Thirdly... take a look at the scar along the brick wall. 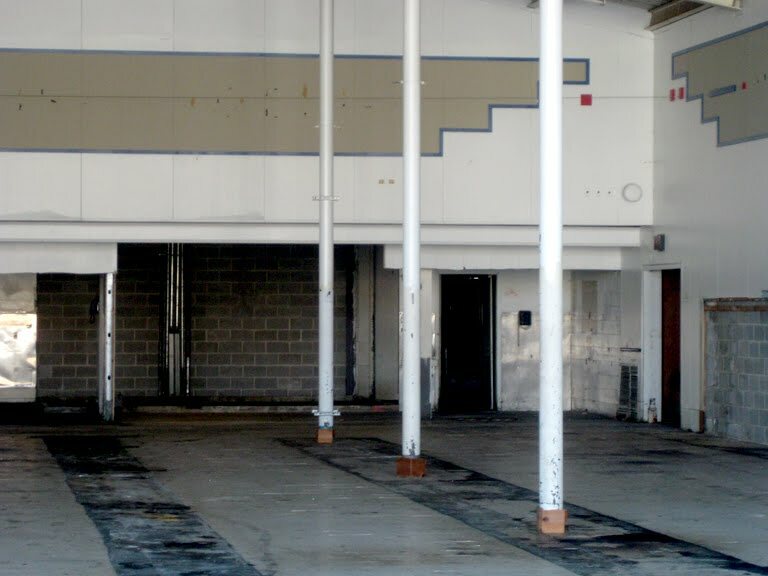 You can see a markings from the steps that went up to the manager's office. Only 7 aisles here. 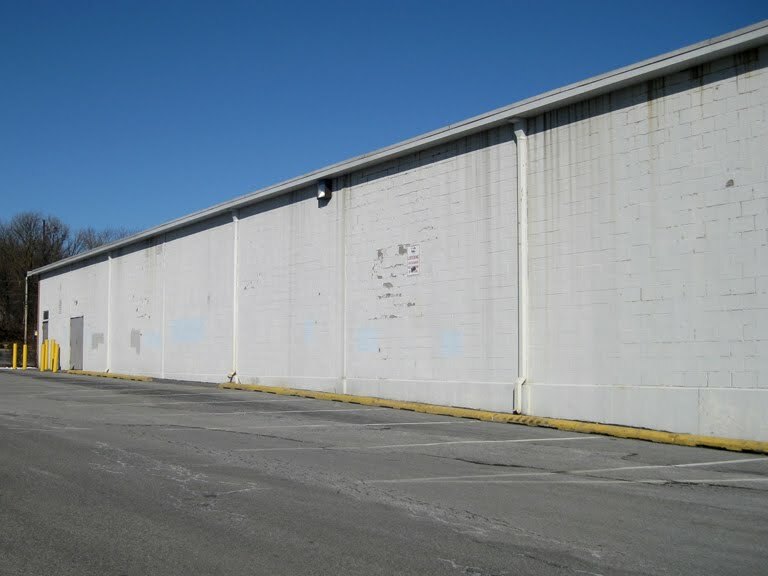 The first and second extended further into the front of the store than the rest. 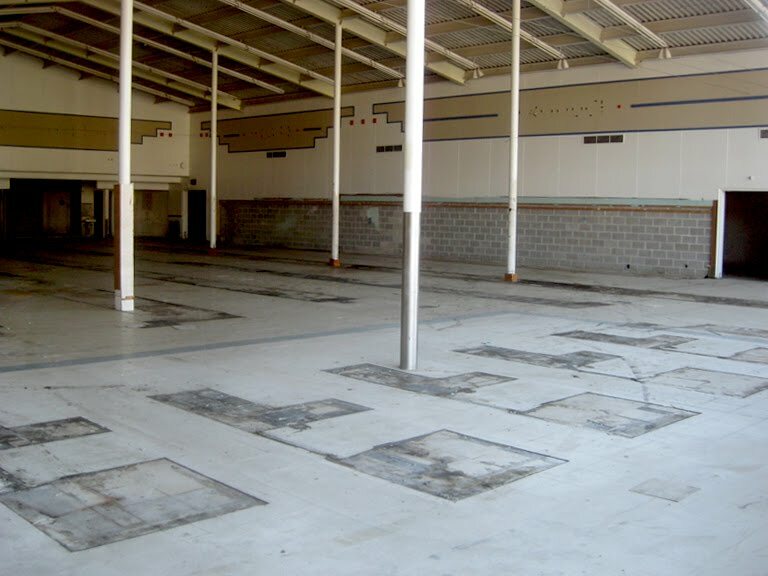 This was common in smaller stores although the aisles were often shortened to match the rest during remodels and upgrades in order to increase space for Produce, seasonal selections and displays for higher profit items. 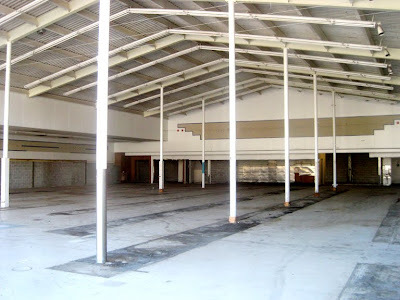 You can see how the first aisle was the longest. 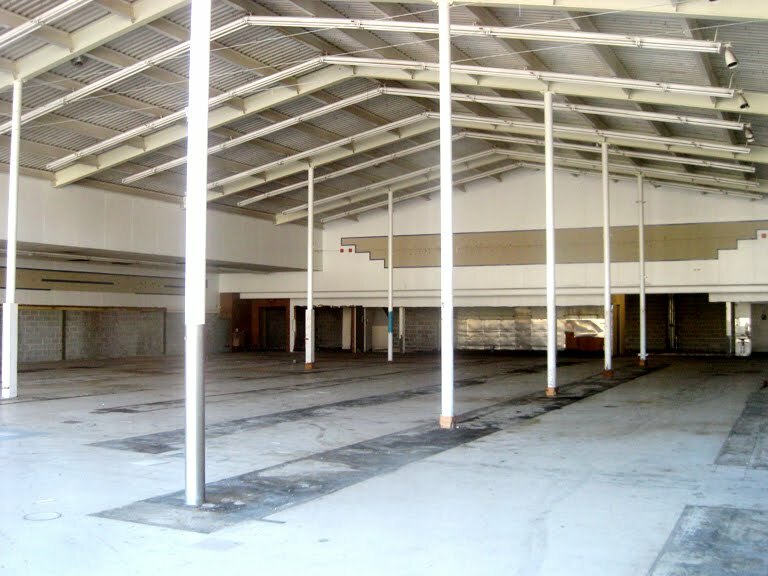 The second aisle, second longest. 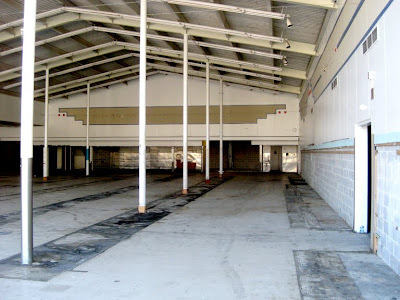 Produce backroom through the door. 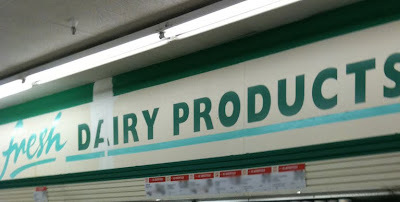 Unlike most Convenience Store upgrades, this store had alot of department names up on the walls. 3 along Produce. The first (which you can see below) may have been "Floral" but doubtful since this store was so small. 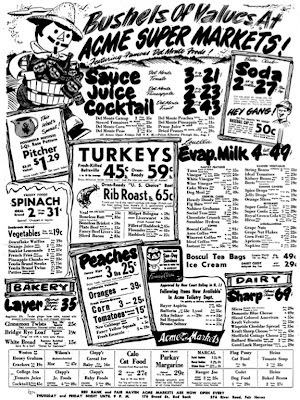 "Lunch Meats" was probably last with "Produce" in the middle. Produce spot lighting still in place but most likely not used since the store's earlier days. 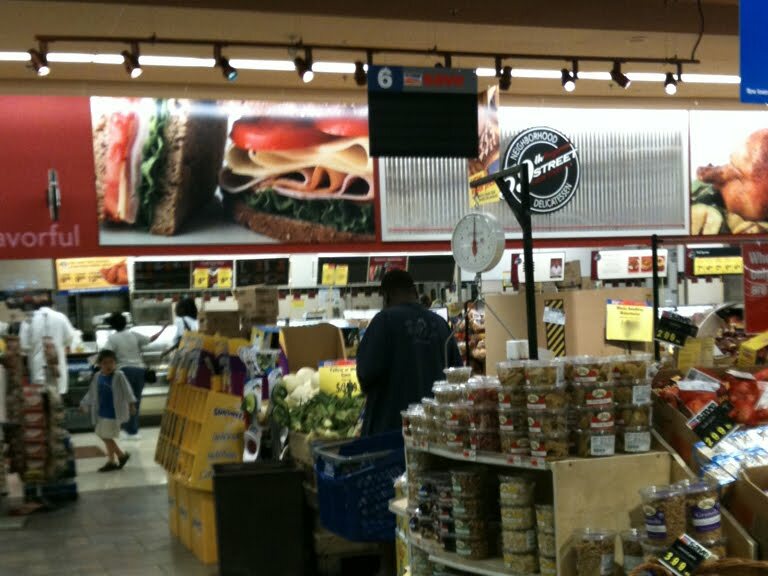 Deli Department in the back corer. 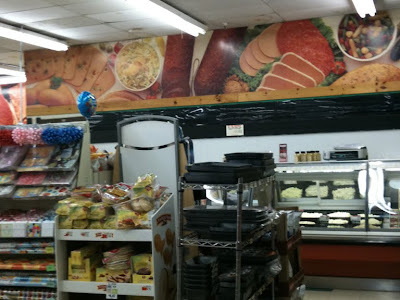 Meat Department along the back wall. The Dairy Department had two names along the wall. 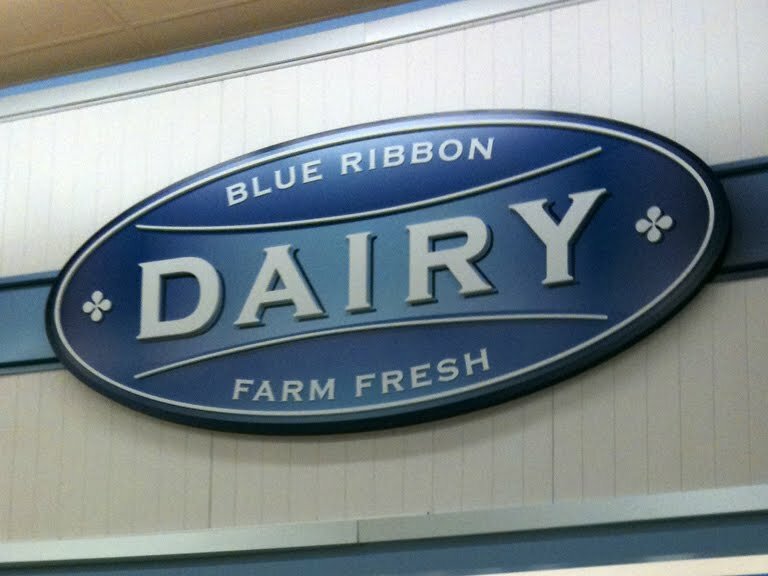 Possibly "Dairy" and "Eggs" which was the standard in the 80's remodels. Small area of original wood paneling back in the corner that didn't get painted white. Check out the old water fountain still in place. "Bakery" most likely on the front section although the bread was often moved to a regular aisle during the 90's so the Dairy aisle could be extended down further. 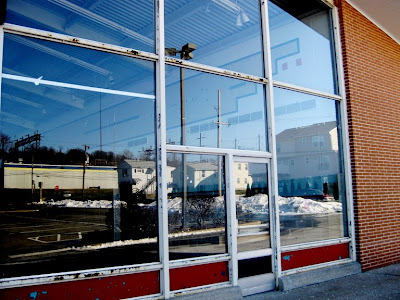 Relatively clean windows and the sun shinning on the back of the store made for some of the best interior shots ever. Some Photoshop tricks help clean the windows for a extra clear view. To see the magic that lives behind this very sign, please click here to see. 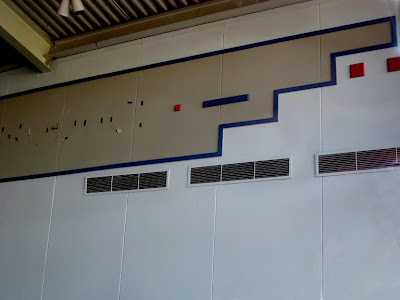 The colored tiles are most definitely still in place on the other side. Removing them would compromise the integrity of the front of the store. 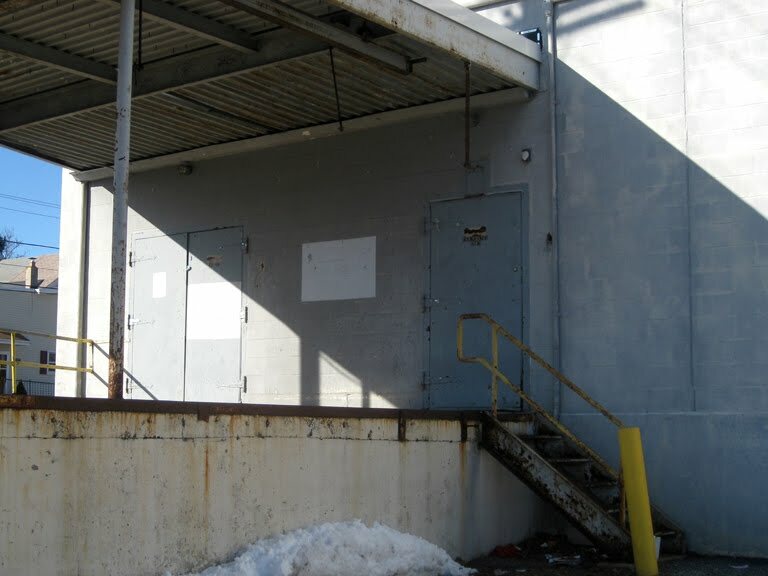 This one is for the fans of backdoor numbers and signage! 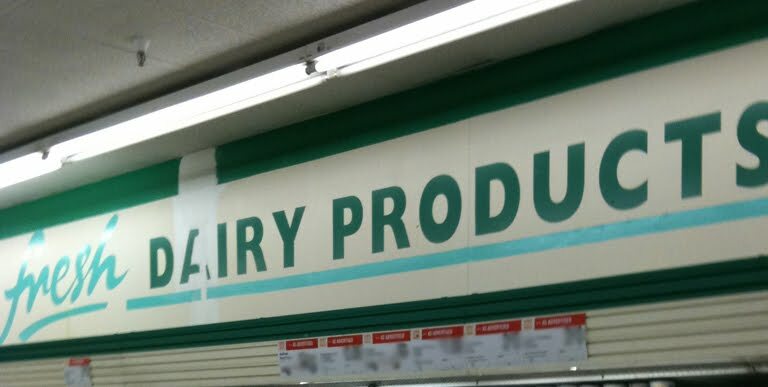 The door on the right says "Frozen Food" and "Dairy". The letters on the left door are blurry even in my original photo. It looks as though it may say "Rubbish". Not sure if that was a backdoor label option. 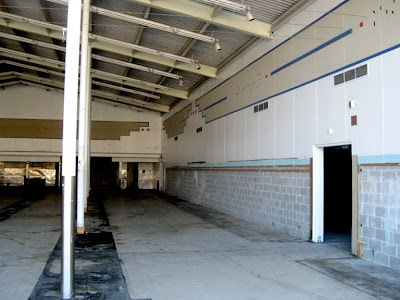 Breakroom and employee bathrooms up on the second floor. Does anyone know the purpose of the overhang at the top? Most pitched-roof stores had them and remain on most that have been converted to other stores. It's one of the biggest clues I look for when confirming a former Acme pitched-roof building. 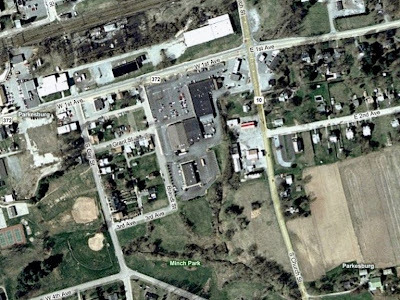 A rear shot is the only "Bird's Eye" view available on Bing Maps. Here's a view of the shopping center from Google Maps. I was so focused on getting up close shots, I didn't get one of the whole center. 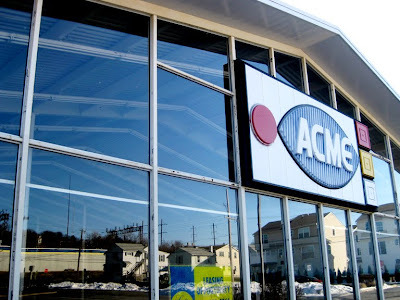 Back in the 60's it seemed Acme went throughout Eastern Pennsylvania and dropped a pitched-roof store in every small town it came across. 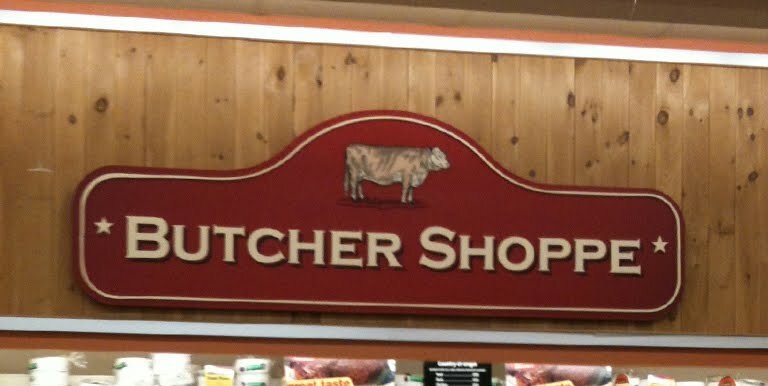 I've said it before and I'll say it again... the greatest grocery store design and store signage of all-time. 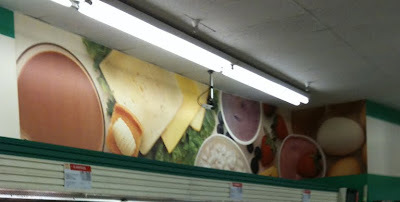 Thank you to the Supermarket Gods who prevented this sign from being painted over when Acme vacated the premises. 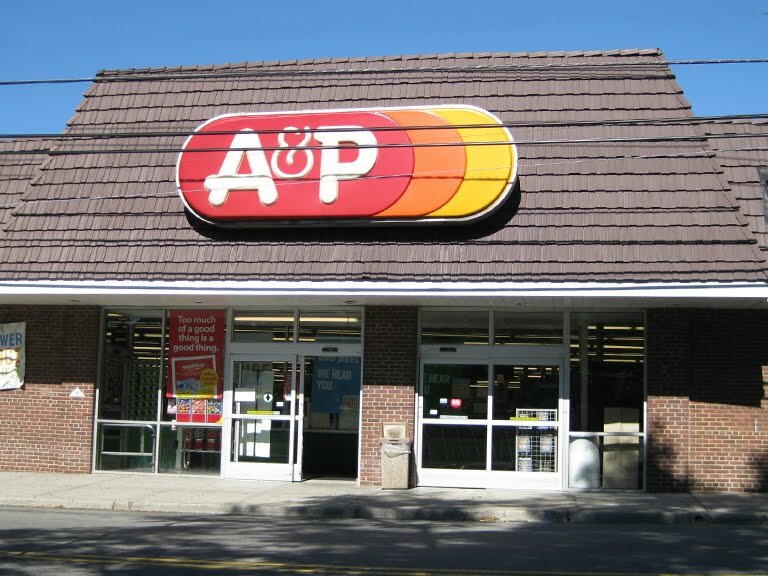 On August 13, A&P announced the closing of 25 stores. Among them, the oldest, and probably one of the smallest, A&P... located here in Maplewood New Jersey. 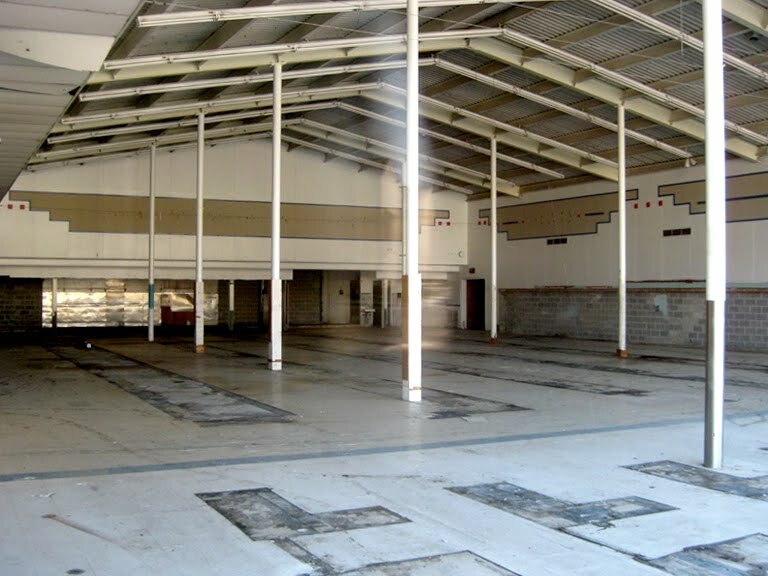 This store has been operating for 68 years now and sadly has just about a month left to go. 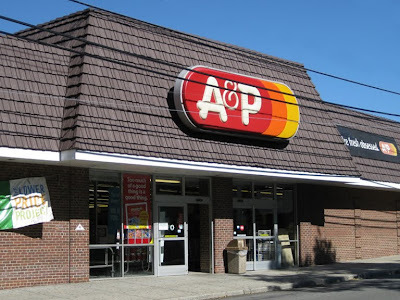 Most of the announced closings are due to A&P and Pathmark overlapping each other in the same area. 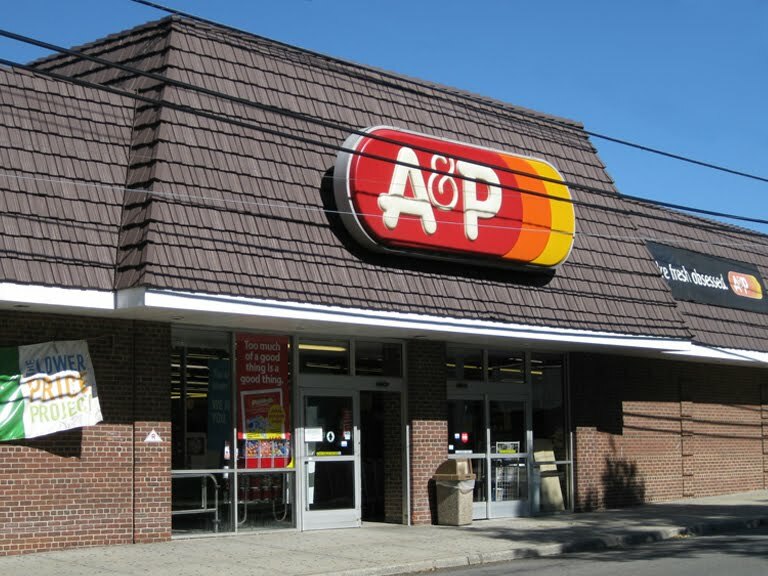 A&P purchased the ailing Pathmark chain back in 2007 and has been suffering huge losses ever since. 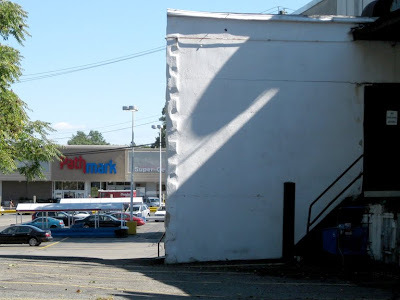 The old Maplewood A&P is right next door to the South Orange Pathmark. They even share a parking lot! You'll believe it when you see it. 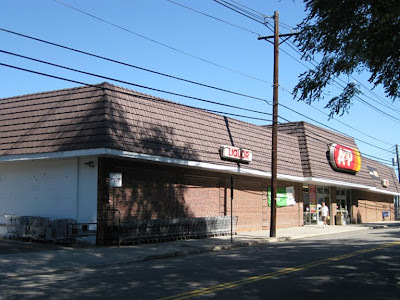 And the news bad news keeps coming... the company is now exploring options to sell off it's Food Emporium division to raise cash and announced yesterday that it is selling 7 of it's Connecticut stores to Big Y Foods, Inc. as it retreats to it's core market area. 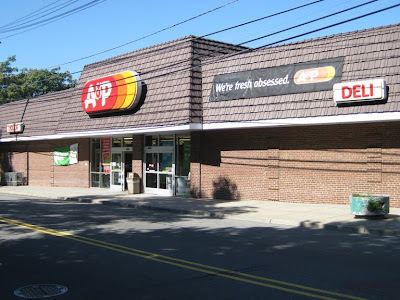 Is this the last street-front A&P? I would imagine it is. 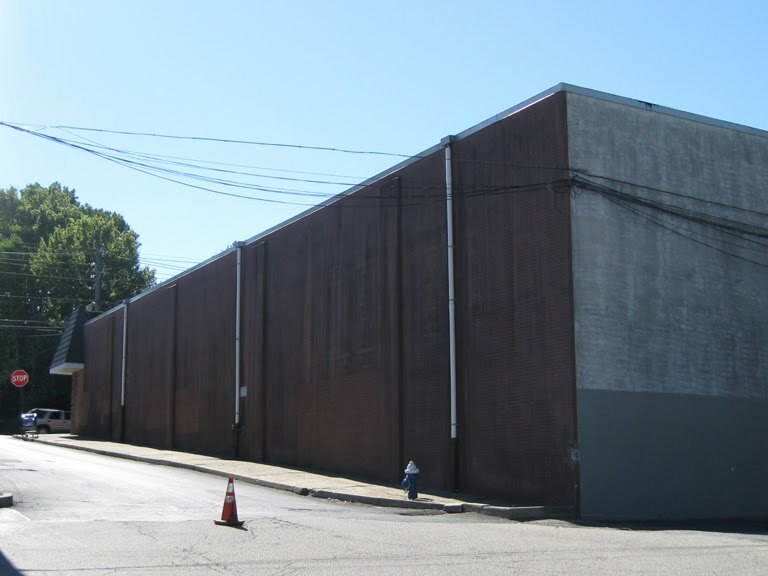 The building was originally half this size which will see down below. "Liquor" has probably played a large role in this outdated store lasting this long. That and it's pure convenience. Easy in. Easy out. You just don't see these signs around much anymore. Still in great shape. 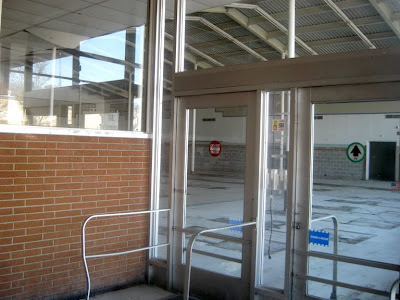 The entrance is in the center of the store. 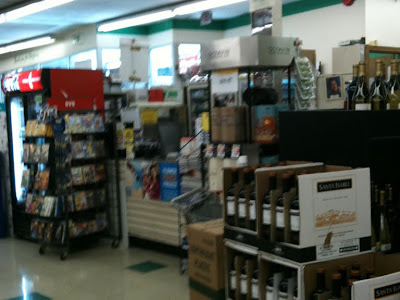 When you walk in, the checkout stands are to the right and Customer Service is tucked away on the left. You can see the small counter there next to the DVD racks. It was hard to spot. 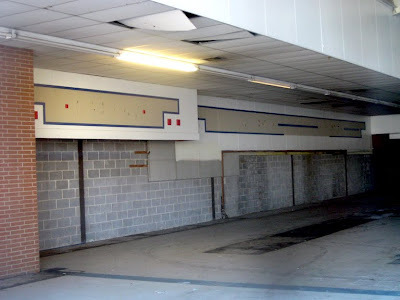 No signage and it's virtually buried behind displays. It looks as though this store was remodeled in the 80's. 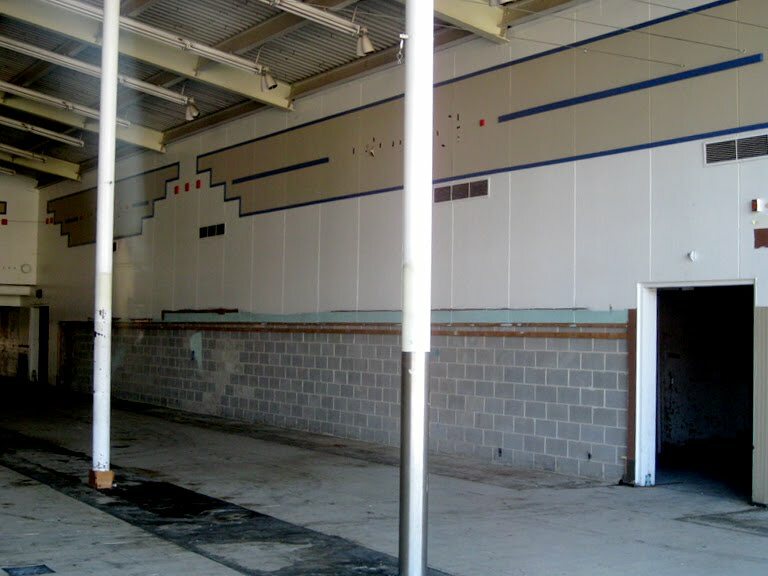 I believe this may have been a decor package for the Sav-A-Center concept. I remember alot of A&P's becoming Sav-A-Centers while others remained A&P's but traded the old orange theme for a green theme. This may also be an early Super Fresh decor package. Big colorful pictures of food are used in this decor package throughout the store. For as old as this decor is, it doesn't look too terribly dated all these years later. 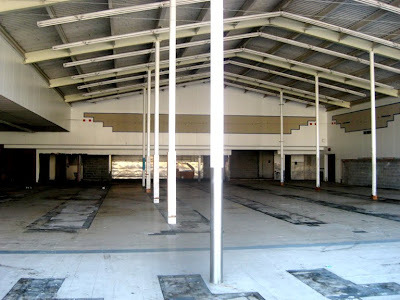 This store is also quite clean for it's age although it could certainly use some freshing up. I gotta say... it was fun exploring this store. The perimeter of the store has the most random selections of merchandise. Great effort has been put into filling every available inch of the store. Regular shoppers probably have it down pat but new shoppers must have a time finding things. Dairy lines the back of the store. 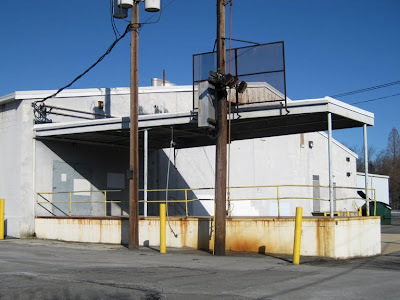 The Meat Department runs along the right wall. Aisle 10. Once extra wide with cases on both sides. 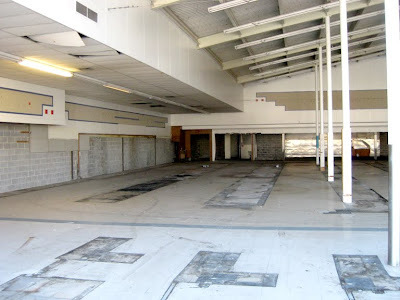 Shelving has been put down the center of the aisle splitting the aisle in two. Check out the old school meat cases! 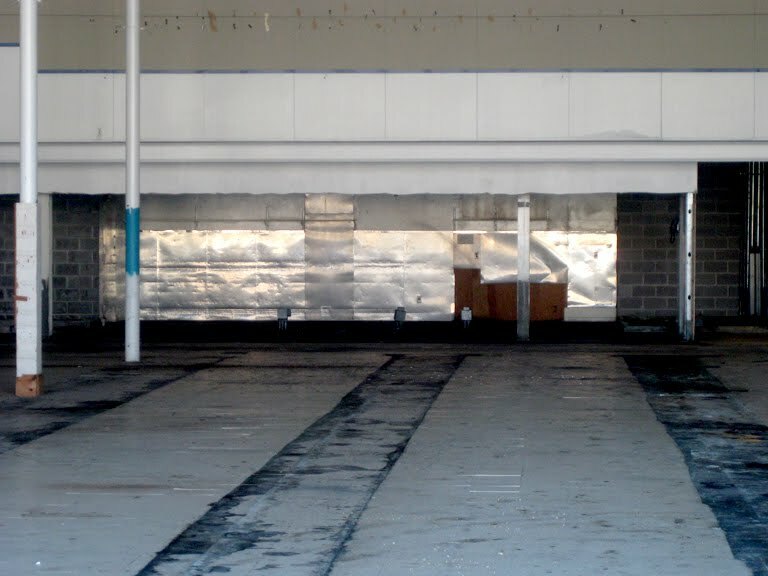 One tier just waist high with mirrors lining the back wall! Wow, did that take me back a few decades. The Deli is here in the front corner. Like Customer Service it's nearly buried from view. You just have to follow the olive loaf to get there. Feels like the Deli was an after-thought. The cases are out in the open siting in front of that enclosed back room. 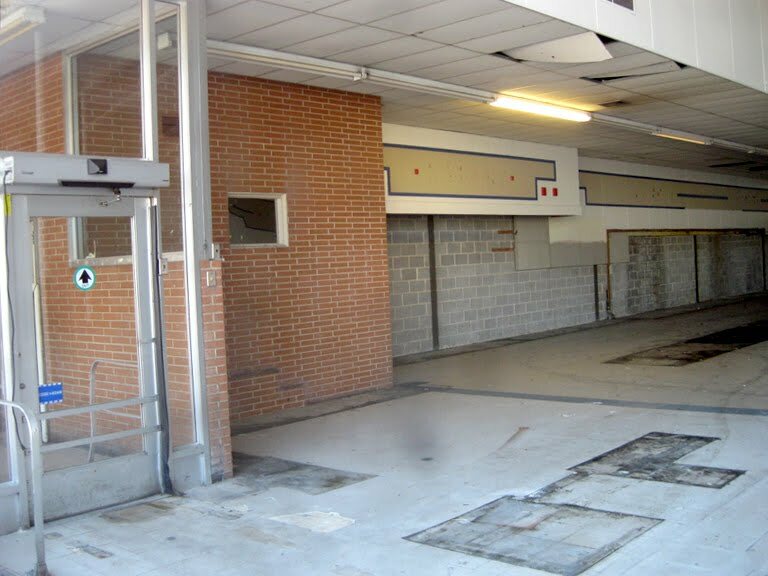 There's no awning, drop ceiling or special lighting to signify this as a service department. 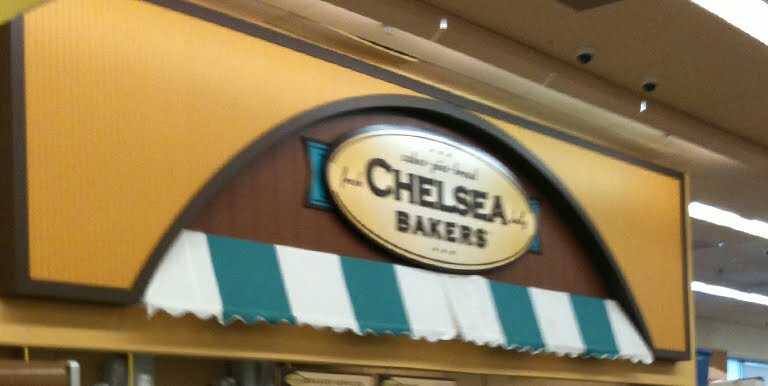 If you didn't know there was a Deli here you would easily miss it. This half is the original building. And the new half. 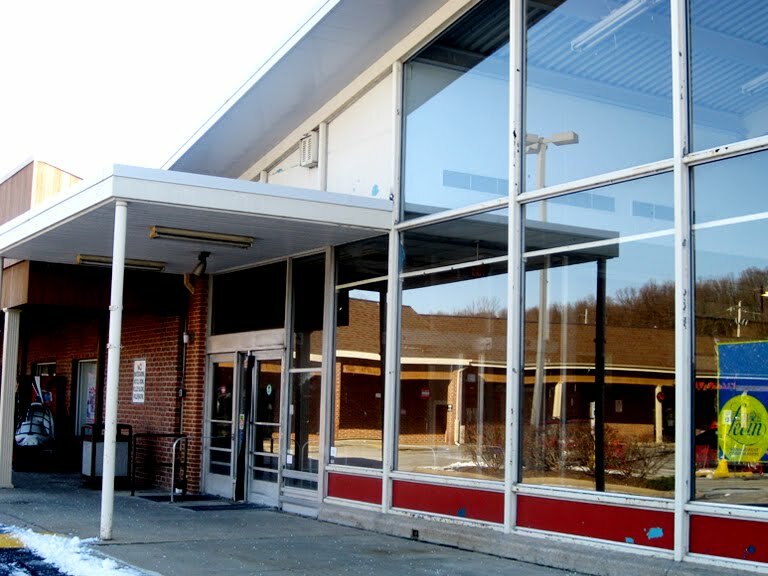 This addition was done sometime between 1969 and 1979. You can roll an A&P cart right to Pathmark's front door. 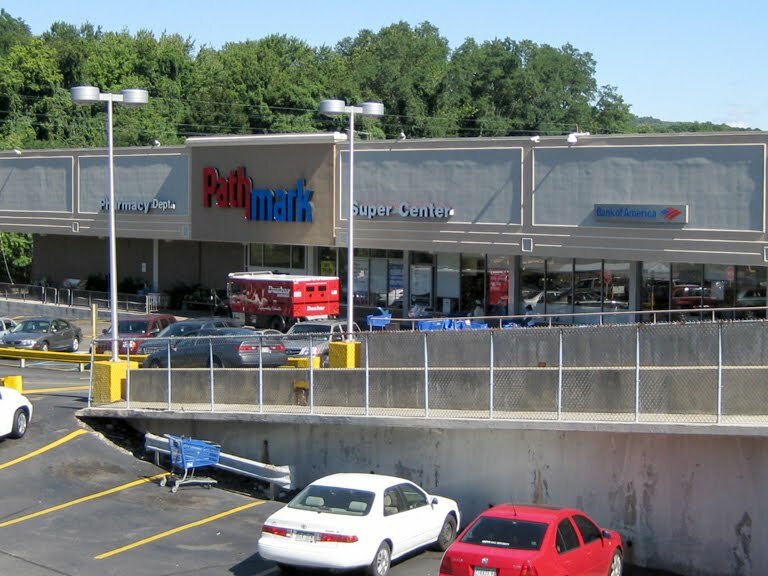 The Pathmark has an odd parking lot situation but the store itself is quite nice. Not huge but freshly remodeled. 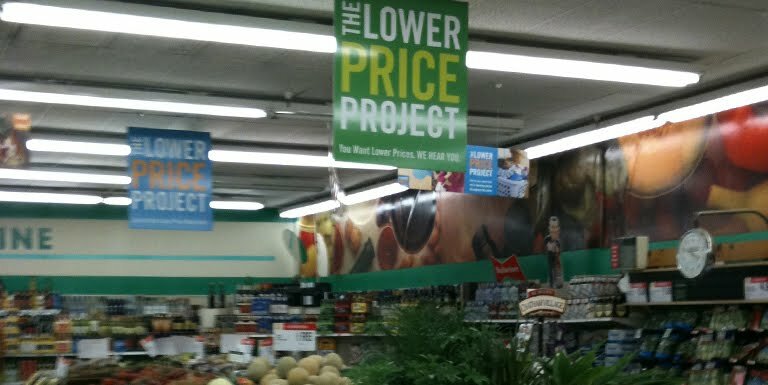 It's one of the few to get the "Go Fresh, Go Local" decor package which unfortunately bit the dust when A&P took over and plastered every inch of every Pathmark with the word "save". 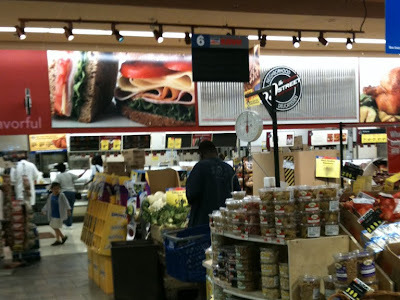 You can check out more pictures of Pathmark's "Go Fresh, Go Local" decor by clicking here. 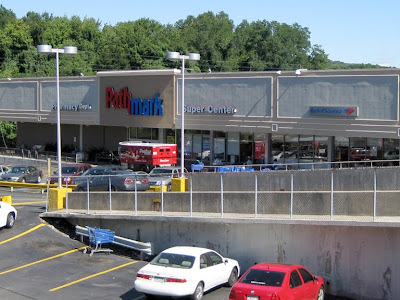 The Pathmark looks massive compared to the little A&P, yet for a Pathmark it's somewhat small. Things were pretty much the same in 1987 as they are today. 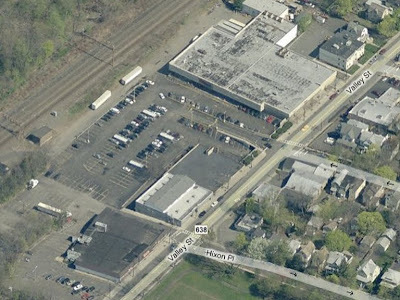 As of 1979, the A&P had doubled in size and the Pathmark had arrived practically next door. 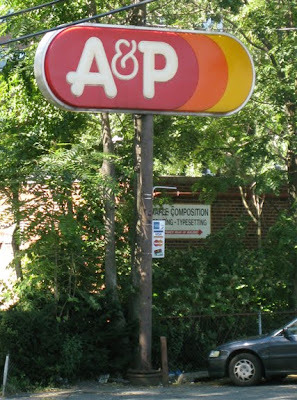 The original A&P with a PACKED parking lot! 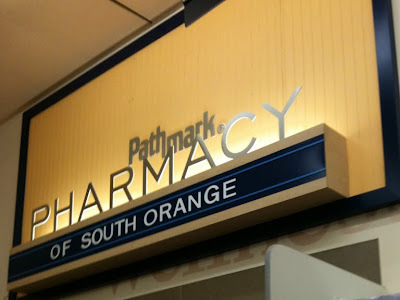 No Pathmark. 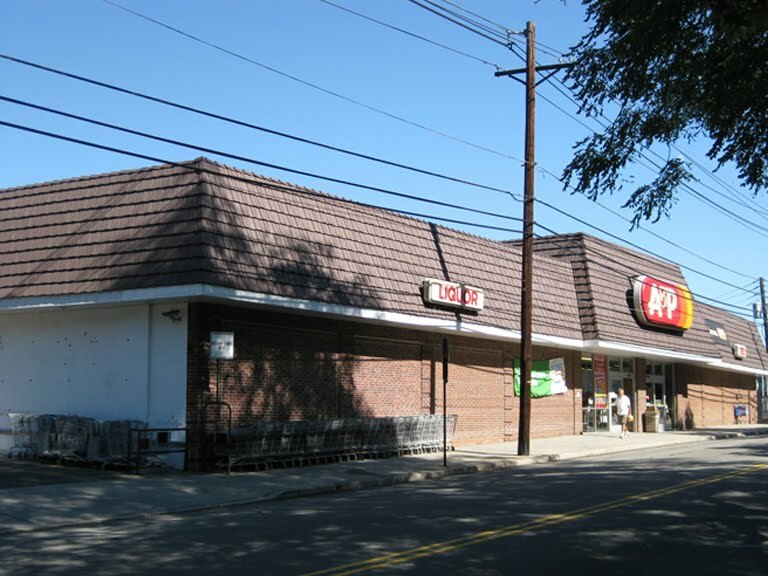 So Pathmark wins here at this location and sadly we must say goodbye to Maplewood A&P! UPDATE: 9.24.10: Store closing signs are up as of today. Jersey Shore Tour Grand Finale!